Some recent examples of Charles’ art. 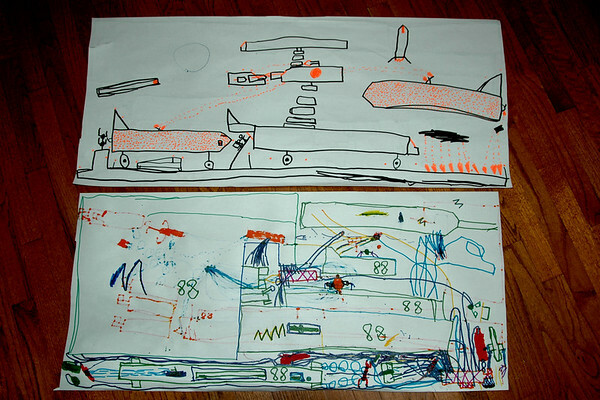 I like the top picture because of the detail, such as all the orange dots on the two airplanes (Charles says those are windows). He has a loading ramp and a guy putting cargo on the cargo plane (note that it doesn’t have windows). That is apparently a very brave cargo loader, working as he is while bombs are falling all over the place. The bottom picture is a more standard space battle scene. It’s interesting because it is one of the earliest pieces where Charles has shifted from numbering things “99” to using “88”. I have no idea why. You can also see, bleeding through, an equally detailed picture on the other side of the paper. Sometimes, when Charles is in full artistic flow, he can’t wait for Dad to get him a new sheet of paper so he flips over what he has and draws on the back.